Click the map to see which states have the college graduates with the most student loan debt. Thanks to rising tuition and a tough job market, college seniors graduated with an average of nearly $27,000 in student loan debt last year. Two-thirds of the class of 2011 held student loans upon graduation, and the average borrower owed $26,600, according to a report from the Institute for College Access & Success' Project on Student Debt. That's up 5% from 2010 and is the highest level of debt in the seven years the report has been published. The increase comes at a time when unemployment has remained stubbornly high for college graduates -- it was at 8.8% for 2011. Those without a college degree are more than twice as likely to end up without jobs, however. The unemployment rate for recent high school graduates was 19.1% last year. Many students in the class of 2011 also entered college right before the recession hit, with many families suddenly finding themselves unable to afford the tuition payments. At the same time, many public colleges have hiked tuition significantly in response to state budget cuts, while private colleges have also been increasing tuition. One thing that has likely kept student debt loads from growing even larger in recent years is increased federal financial aid, the report said. "In these tough times, a college degree is still your best bet for getting a job and decent pay," said TICAS President Lauren Asher. "But, as debt levels rise, fear of loans can prevent students from getting the education they need to succeed." The school you choose matters: The amount of debt a student has upon graduation can vary dramatically depending on the school they attend. Of the 1,057 colleges in the study, average debt per graduate ranged from $3,000 to $55,250. At 114 colleges, graduates had average debt above $35,000, while 64 colleges said that more than 90% of seniors graduate with debt. Tuition, fees, the availability of financial aid and the cost of living all factor into the amount of debt students wind up with, the report found. "Students and parents need to know that, even at similar looking schools, debt levels can be wildly different," said Asher. While Indiana University of Pennsylvania and Clarion University of Pennsylvania are both public four-year colleges and charge annual tuition and fees of roughly $7,500, for example, graduates of Indiana University of Pennsylvania had average debt of $32,416 while Clarion University graduates had average debt of only $3,815. The Project on Student Debt said since certain schools didn't submit data, it didn't have enough information to rank colleges by their debt, but it did highlight "high debt" schools and "low debt" schools. The schools where students graduated with the highest average debt loads -- between $31,900 and $46,700 -- include Franklin Pierce University in New Hampshire, La Salle University in Pennsylvania, Morgan State University in Maryland and Kentucky State University. Franklin Pierce graduates, for example, owed an average of $44,702, while Kentucky State graduates owed an average of $36,293. Schools with the lowest average debt -- between $3,000 and $9,750 -- include Williams College in Massachusetts, Yale University in Connecticut, Pomona College in California, College of the Ozarks in Missouri and Berea College in Kentucky. Yale graduates were $9,254 in debt, while Pomona graduates owed $7,540. State-by-state: The money students owed varied significantly from state to state as well -- ranging from $17,227 to $32,440. 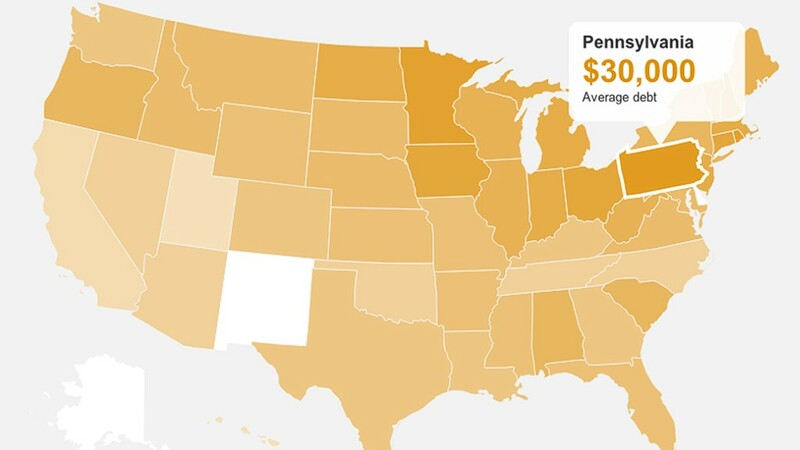 Students in New Hampshire owed the most, with average debt of $32,440, and Pennsylvania followed with average debt of $29,959. Utah and Hawaii had the lowest levels of debt, at $17,227 and $17,447, respectively. Overall, students in the Northeast and Midwest had the most debt, while Western and the Southern states had students with the least amount of debt. The 1,057 colleges that were polled in the study represent half of all public and private nonprofit four-year schools. Because the data is voluntarily reported by colleges, actual debt is likely higher than the report indicates -- especially because so few for-profit colleges chose to report data. Private student loans, which are found to be more risky and expensive than federal loans, accounted for one-fifth of the amount of debt students owed. As students pile on more debt, they are also having a harder time repaying it. The percentage of borrowers who defaulted on their federal student loans within two years of their first payment jumped from 8.8% to 9.1% in fiscal year 2011, the U.S. Department of Education reported earlier this month.